WordPress sites are often sought by bloggers, small scale online entrepreneurs, and even bigger companies who want invade the internet marketplace. This is because WordPress sites are easy to manage; they can be updated even by newbie users, and can be easily customized according to the user’s preferences. If you happen to be looking for a WordPress hosting company that you can rely on, then perhaps you should take a look at what Page.ly has to offer. It is one of the first WordPress managed hosting service in the market that takes care of the technical aspect of keeping your site live, thus you can focus mainly on churning content. Page.ly is a webhosting company that offers only in WordPress platform. Unlike other hosting solutions that provide scripts that can be installed to build a website, this company focuses specifically on WordPress, and nothing else. Page.ly has been instrumental in the online establishments of various brands, such as Vonage, Freeskier, GetSatisfaction, BugCrowd, Vail Resorts, Publisher’s Clearing House, and Yammer, to name a few. 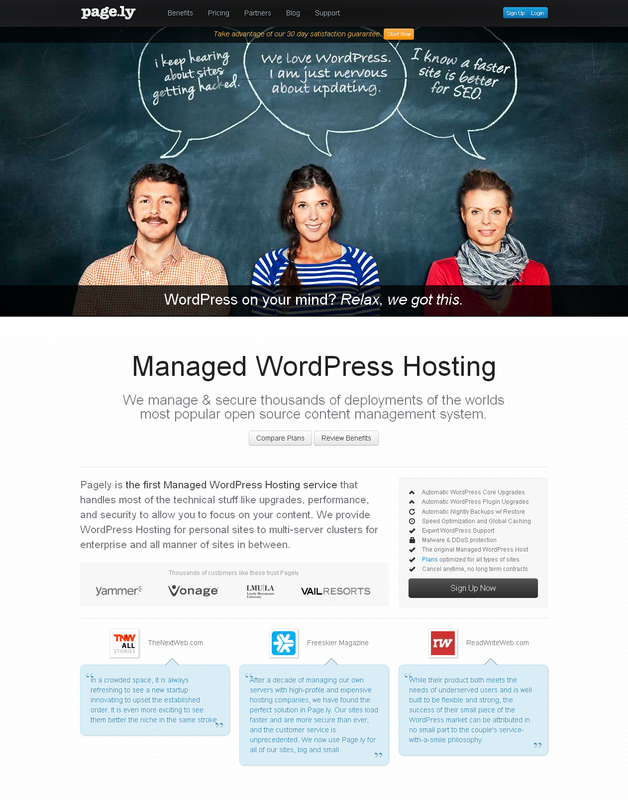 •	Highly credible WordPress hosting. There are a lot of companies who are starting to focus on WordPress hosting alone, and this is because Page.ly started the trend. Since its re-launch in 2009, this company became the most wanted name when it comes to WordPress hosting. You wouldn’t want to settle for less, right? •	99.9% security. One of the best features of Page.ly is that it maintains excellent security measures on its project sites. It has a team of experts who manage and monitor client sites on a regular basis to make sure that they are hack-proof and scam-proof. •	Advanced caching. Each site managed by Page.ly is pushed through a caching layer that accommodates requests at 54ms on the average. This provides sites with super fast loading speed and as well as a better position in search engine rankings. •	Cloud service. Page.ly offers WordPress hosting via cloud service, making site management more scalable for clients with different needs. All packages offered by Page.ly come with a open cancelation contract. Customers may cancel anytime they feel like they don’t need the company’s services anymore. •	Personal. The Personal package costs $24 per month, and is ideal for a small website or blog. It can accommodate up to 20,000 site visits, 10GB bandwidth and 5GB storage. It has all core features and the Enterprise DNS pro feature. •	Business. The Business package meanwhile costs $64 per month, and is the most popular plan available. It includes up to 200,000 visitors, all core features, 3 pro features, 50GB bandwidth, and 15GB storage. •	Professional. The Professional package costs $149 per month. It can accommodate up to 750,000 visits, all core features, 4 pro features, 100GB, and 35GB storage. •	Enterprise. The Enterprise package meanwhile includes all core and pro features, millions of site visits, $0.17GB bandwidth and $2.5GB storage. This package is available on a per quote basis. Page.ly is a highly ideal WordPress hosting service that caters to site owners who are more familiar in using the WordPress platform. However, if there’s one downside often seen in the brand’s packages, then that would be the pricing. The hosting solutions of Page.ly are quite more expensive compared to the industry average. Some users, especially those who are new to online markets, may find the brand’s plans exorbitant to think they can find similar services with other hosting companies. Page.ly is also more ideal for site owners who do not want to dabble on the tech aspects of site management. However, those who are already used to maintaining their sites’ technical needs may no longer need the services included in the brand’s packages. Page.ly is also a leading brand in terms of customer support. It accommodates all client inquiries over the phone, chat and through email. It also offers premium customer service handling on Pro and Enterprise customers, with dedicated agents and tech support groups assigned to one particular account. Meanwhile, subscribers of lower packages are also able to enjoy 24/7 support, also through phone and chat. If you are running a website using the WordPress platform and would want to hand certain tasks to a hosting provider instead, then Page.ly is the best choice. This is because this hosting provider knows not only to boost the power of WordPress, but also give users a helping hand in managing their WordPress sites and blogs. Page.ly has proven to be a very important source of WordPress hosting. This is mainly because WordPress is currently the most trusted tool in setting up blogs and simple websites, is user-friendly and very compatible with different operating systems. Indeed, the prices of Page.ly’s package are above industry average, but they often prove to be worth the price. Accounts are handled by well-trained network admins, website design managers and tech specialists. Clients are then saved from spending extra on web design services from another provider as the same tasks can be handled by the brand itself.